Periodontal disease is more common than you might think. Health statistics indicate that about 75 percent of adults show signs of gum disease. It begins as gingivitis, which is the early stage of gum disease, but is also a progressive oral infection. If left untreated, gum disease can destroy gum tissue, teeth, bone and is even linked to other life threatening health problems. Gum disease can be prevented with good home oral care and regular visits for cleanings and exams. Dr. Chris Stevens and Dr. Dan Stevens can also treat patients with gingivitis and the moderate to advanced stages of periodontal disease in the Madison, WI region using a variety of modern techniques and technology. Call today to arrange your consultation. The first signs of gum disease, such as red, bleeding, or swollen gum tissue, usually result from poor oral hygiene. Bacteria grow in the oral environment and unless they are removed daily with proper flossing and brushing, bacteria can irritate the gums. Gingivitis is very treatable because the bone and structures that support the teeth are not yet affected. Treating gingivitis removes the bacteria and plaque, restores health to the gums, and saves teeth and bone. When left untreated, gingivitis will continue to progress and damage the teeth and bone. At this stage, bacteria are burrowing deeper under the gum line, creating periodontal pockets around the teeth, and destroying their supporting fibers and bone structure. Gum recession, bleeding, and noticeable gaps between the teeth as well as bad breath are common at this stage. Treatment is critical to saving teeth and preventing further damage. Advanced gum disease is very serious. Now the bacteria are proliferating at a greater rate and completely destroying the connective tissues and bone that protect teeth and prevent them from falling out. 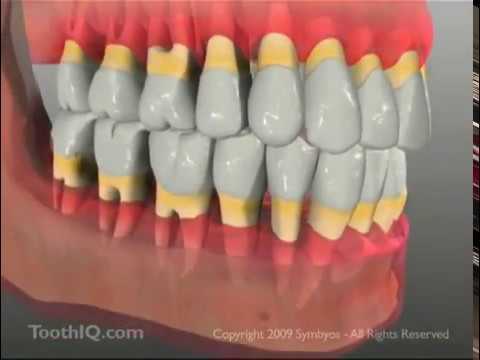 Patients with advanced periodontitis may start to lose teeth at this point or experience teeth that are loose. Shifting teeth will also cause problems with the bite. Seeking professional gum disease treatment as soon as possible is strongly advised to save remaining teeth and bone.